I love that Saladin Ahmed’s Spider-Man Annual comes out right after Marvel announces that he’ll be taking over Miles Morales. I’m not familiar with the writer but I have heard great things, so I was excited to see if they would apply to the spider corner of the Marvel universe, too, and…. Not looking good so far. Because Venom is all the rage right now, The Amazing Spider-Man Annual focuses on Peter’s time with the symbiote and the antics that apparently ensued whenever it took Peter’s “meat” out for a spin… And I have to be honest, I’m really not sure what the point of the story was. The symbiote hands out some pretty brutal but not quite lethal protection, befriends a kid that it saves, and then we pick up with the part that we know and Peter gets rid of the thing. I’m afraid Ahmed was having a hard time making this fill up enough space for an annual, too, because the first SIX pages are a recap, even though the book has a dedicated recap page for anybody who isn’t vaguely familiar with Spider-Man and his time with alien costume. 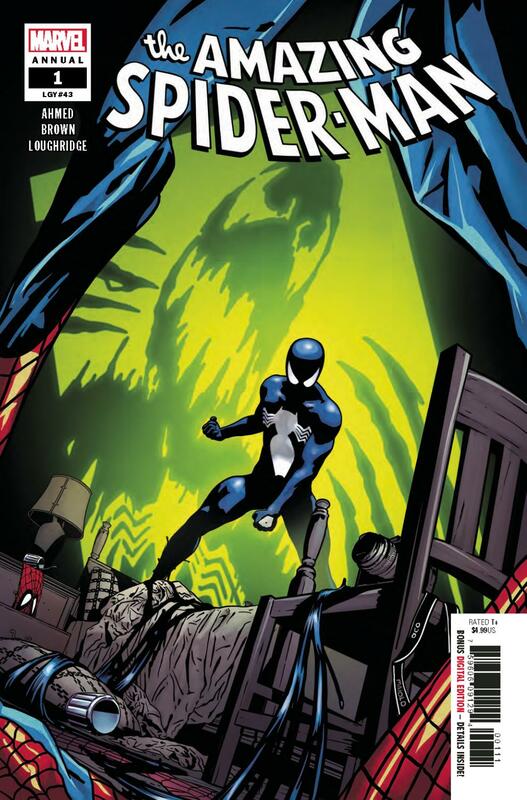 I would have been okay with one page to tell us what the recap page doesn’t – that the symbiote would control Peter’s body at night – but six pages for what I just explained in barely a sentence? So much of this could have been cut to make the book cheaper. Maybe then I wouldn’t be so against recommending this to anyone. I guess the rest is supposed to be a lesson for the symbiote about crossing a line as a vigilante, but the symbiote itself doesn’t acknowledge this lesson and of course crosses that line by a couple miles later on. Rather than playing up the irony of the situation, it just looks like the book forgot about the whole thing and has zero self-awareness. You may have noticed my reference to the symbiote referring to Peter’s body as his “meat,” and yes, it’s totally weird. It does not work in context, and that’s not all. The dialogue in this issue is just not good. It’s very hello-fellow-kids. It never feels like what we’re reading is actually how these characters talk, but instead it’s like someone else is doing an impression of them. It kind of reminds me of Luis’s recaps in the Ant-Man movies. This also seems like a good time for me to point out once again that the symbiote should not refer to itself as we. Yes, this is the most nitpicky part of this review, but man, does this bug me. Venom uses “we” in reference to the symbiote and its host. Separately, they are “I”. I promise, I’m not trying to be mean when I say this, but this issue honestly can look like it’s being told from a child’s point of view through their drawings. To Garry Brown’s credit, it certainly has more detail, but sometimes it’s just a few scribbles and coloring outside the lines away from being hung on the fridge. Proportions are wack. These poses don’t look natural at all, the faces usually just look so unfinished, etc. I could go on. Lee Loughridge’s contributions to the art are really hit or miss. I like the Ben Day dots added to emulate the look of a book from when this would have been chronologically released; those are a nice touch. The Secret Wars splash page has way too many dull colors for an event featuring so many colorful characters, and unfortunately the rest of the book often suffers from a similar monotony. City lights are often the saving grace by offering some much needed contrast and flair to pages that are too frequently bogged down by overcrowded shades of black, gray, and blue. Yeah, they occasionally lend a hand to the mood, but I found myself more bored by them than welcoming them.